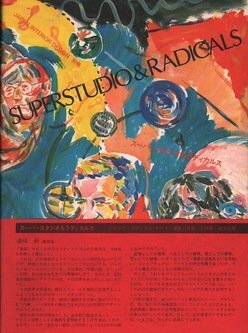 Edited by Superstudio and The Moriyama Editors Studio. Japanese and English text. Beautifully designed book on 70’s Italian radical architecture and design collective Superstudio, which pursued an “anthropological and philosophical refoundation of architecture,” with both imaginary and actual results. Illustrated with six colour gatefolds of visionary schemes, and over 100 illustrations of architectural conceptions and interior design, along with several reprintings of manifestos and philosophical writings on architecture. pp. 258; paperback. Publisher: Toppan, Tokyo, 1982.